The magical mind of potter Bill O'Callaghan is on display all over the Island. 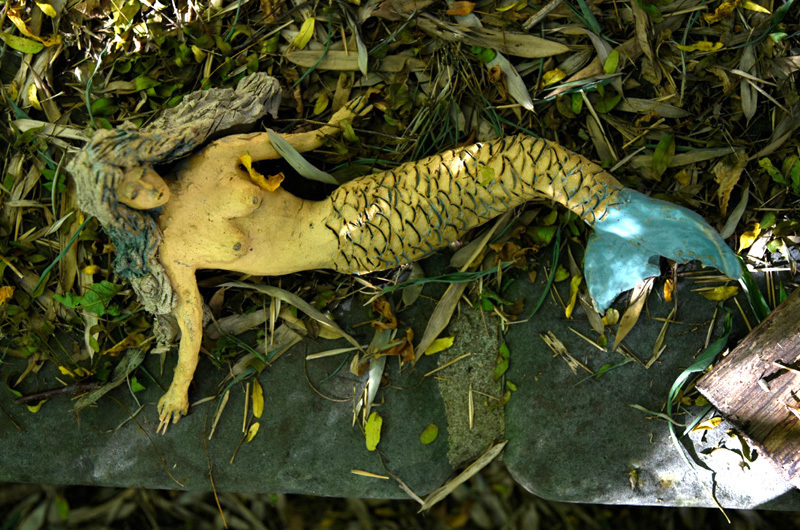 Behind a garden fence in Vineyard Haven lies a realm of castles, dragons, minstrels and mermaids, all crafted in clay by Bill O’Callaghan. This fanciful world, of his own imagination, is becoming increasingly familiar to Islanders and visitors (especially their children) through the seasonal Walk Through Imagination tours at Polly Hill Arboretum that Mr. O’Callaghan and his wife Robin have created each summer for the past five years. “My wife does the story and I do the sculptures. It’s built up a little reputation,” said Mr. O’Callaghan, who is already gathering materials for next year’s tour. He’s also just opened a new exhibition of his photography at the West Tisbury Free Public Library, with an artist’s reception Saturday from 4 to 5 p.m. Mr. O’Callaghan’s art is imbued with a sense of magic he’s never lost from his childhood in Cork, Ireland, where he read all the fairy tales, legends and Irish folklore he could find at the library. “Of course, it rained all the time in Ireland, so I read,” he said with a laugh. Along with his work in high-fire stoneware — the pieces spend 10 to 12 hours in a 2,400-degree kiln — Mr. O’Callaghan also builds furniture, picture frames and artwork out of found wood and stones, letting the shapes of the materials guide his imagination. In Mr. O’Callaghan’s back yard, life-sized clay minstrels and tiny fiddlers, an elaborate castle with a dragon twined around its turrets and a head-high “gingerbread cottage” are surrounded by colorful dahlias against a towering backdrop of bamboo. “I like to tell a story,” he says. But the story a visitor sees is not always the one Mr. O’Callaghan had in mind when he sculpted it. Mr. O’Callaghan’s new photos are also narrative, with a twist. Many of them include friends and family members, costumed to fit the magical surroundings of his garden-gallery-studio. Amid blue-turreted castles, garden flowers and an arbor made from high-bush blueberry branches, his subjects appear as fairies and sprites perched on a woodland throne. All of the images are framed in Mr. O’Callaghan’s signature wood-and-stone work, with no two frames alike. There is also a framed mirror and — of special appeal to Game of Thrones fans — a photo of three “Ice Dragons” in their lair. 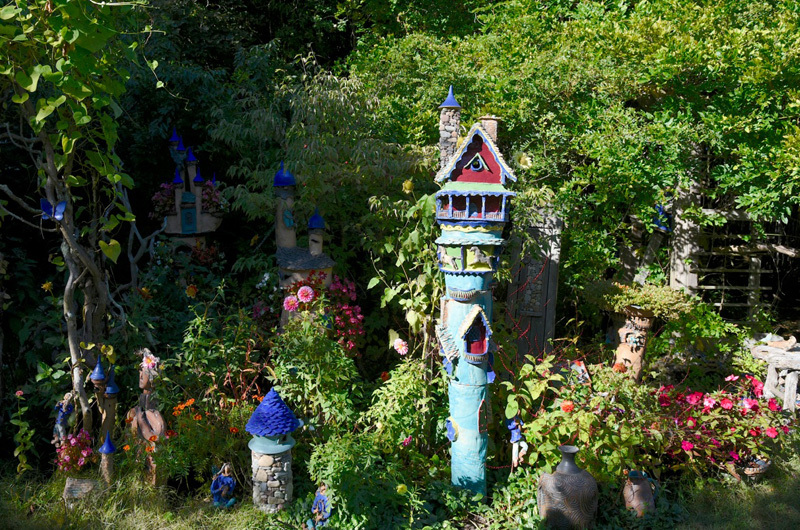 In addition to the photographs, frames and mirror, Mr. O’Callaghan has one fantasy sculpture in the West Tisbury library show: a garden-ready fairy house, its roof blooming with real flowers and crowned by a clay fiddler. Mr. O’Callaghan wasn’t originally the Mad Potter, as he dubs himself (“mad” in Ireland meaning “fab” rather than “nuts”). Arriving on Martha’s Vineyard as a young man more than 30 years ago, he worked as a mason and carpenter before learning to work with clay. He still plies his other trades as needed, and built his own brick kiln house — complete with Gothic windows and hand-made door — in the back yard, where he also sculpts the clay as weather permits. While his fantasy sculptures and handmade frames have found favor at the Vineyard Artisans Festivals, where Mr. O’Callaghan exhibits regularly, he’s continuing to experiment with new forms. To photograph his work, he bought a camera and took an ACE MV course with Gazette photographer Maria Thibodeau, he said. And while he formerly used color only as an accent for his clay sculptures, mixing his own blue and green pigments, Mr. O’Callaghan is now using more and brighter hues. His Gingerbread Cottage, built totem-pole style in multiple sections, is a polychrome fantasy with a stone chimney, a wraparound porch and a frieze of horses instead of a dragon. 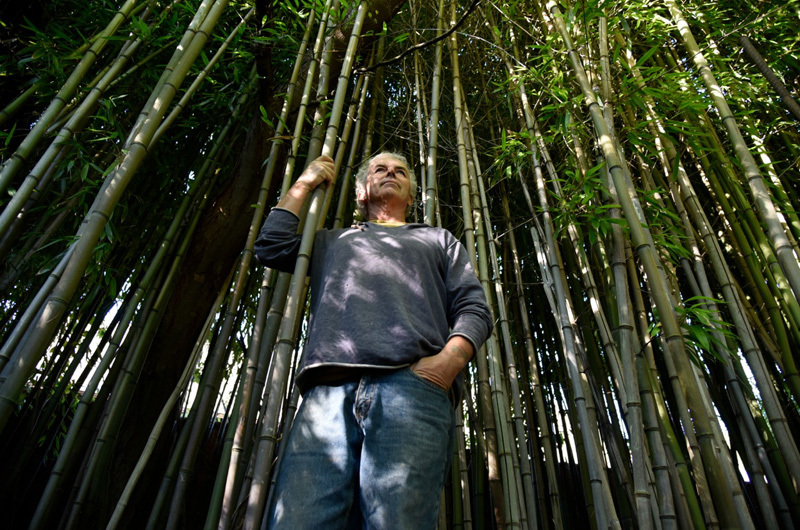 It took him all summer to create the new piece, which will take its place in next year’s Walk Through Imagination at Polly Hill, Mr. O’Callaghan said. The theme of the story: The Gingerbread Man. Mr. O’Callaghan’s photographs can be viewed at the West Tisbury library during regular library hours. For more information and images of his work, visit madpottermv.com. When in Edgartown, we invite you to take a walk along Dock street to the northern end.